Areeya Village. 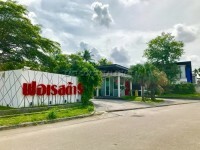 This secure village is set along Siam Country Club Road in East Pattaya, just 10 minutes from 3 of the most popular golf courses at Siam Country Club Golf Club and Resort. One of these courses is on the Ladies PGA calendar. The village is quiet and secure with its own 24 hour security guards and a CCTV camera system all around the village. There is also a communal swimming pool, children’s playground and a nice communal park with landscaped gardens. This 3 bedroom home includes fully furniture and air conditioning throughout. There is also a nice European kitchen and a good living area. At the front of the property is under cover car parking and a small fish pond. The owner of the property will allow tenants to bring their pets.